He's threatened this before, but this time I think it's for real. 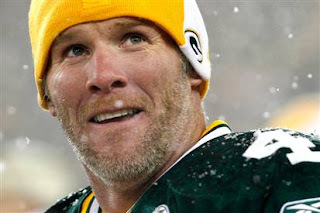 Packer fans (and football fans of all teams) will miss this one-of-a-kind quarterback AND person. A true role model in a sport that's too often tarnished by character flaws. He's broken Dan Marino’s career records for most touchdown passes and most yards passing and John Elway’s record for most career victories by a starting quarterback. No other quarterback can touch his consecutive regular-season starts (253 games — trademark toughness, especially with Lambeau Field as home). With playoffs, the streak stands at 275. He retires with 5,377 career completions in 8,758 attempts for 61,655 yards, 442 touchdowns and 288 interceptions. Thanks for keepin' it real, Brett. We'll miss you. Hippity Hoppity Ho Ho Ho! Thoroughly pickled. [hicc] I mean tickled. Mars trumps Venus. Every time.